MERRITT ISLAND, Florida – Today, SeaWorld Orlando’s Animal Rescue team traveled to Merritt Island, Florida to return a rescued manatee and her two-week-old calf to their natural environment. The pair was successfully returned to the waters of Sykes Creek, where mom was originally rescued. The female manatee was pregnant when she was rescued about two months ago, and during her rehabilitation at SeaWorld Orlando gave birth to a healthy male calf. Once the pair had bonded and the veterinary team confirmed that the calf was nursing, the park’s animal experts felt the manatees had an excellent chance to survive on their own. SeaWorld’s ultimate goal is to return rescued animals to the wild once they are in good health. 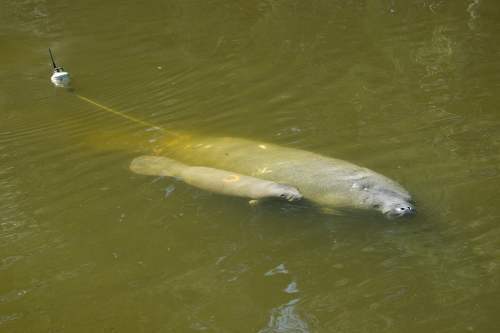 On June 8, 2012, SeaWorld’s animal rescue team rescued the 10-foot manatee from Sykes Creek. She had severe injuries to her front right flipper caused by a crab pot line, and fishing line was also tightly wrapped around both of her front flippers. Weighing nearly 1,380 pounds, the manatee was transported by the rescue team to SeaWorld Orlando for further evaluation and care. After assessment, her front right flipper was amputated and bandaged. She received antibiotics and was treated for her injuries, and her health continued to improve. Based on her size, SeaWorld’s veterinary team suspected the manatee could be pregnant. After performing a sonogram procedure on the gentle giant, it was confirmed that she was pregnant and about six weeks later, the calf was born. SeaWorld Orlando’s Animal Care team kept a close eye on the pair, to ensure they were both healthy enough for yesterday’s return.